Public and industry education continues before the action phase of our campaigns. Everyone needs to know what is at stake and be able to clearly speak to it when communicating with those in places of power. 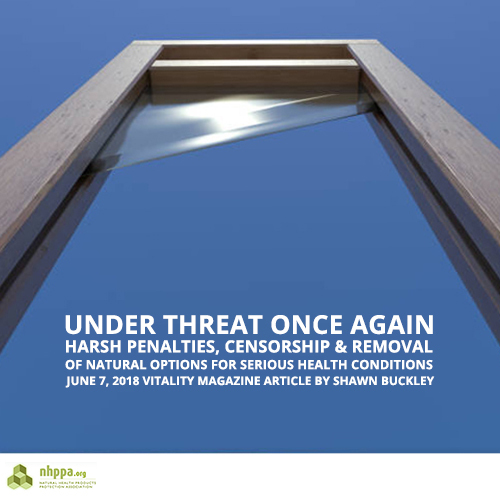 Vitality Magazine released its June/July issue which includes an article (7 minute read), “Natural Health Products Under Threat – Once Again” by Shawn Buckley. In it, Shawn states “although Health Canada uses safety language to support their actions, they are in reality the drug police whose job it is to uphold the law, regardless of the health consequences”. Canadian consumers, manufacturers, retailers and practitioners now face the biggest threat to natural health products and practices, ever. It is important to take the time to read Shawn’s article to understand how these changes will affect you and what steps you can take to help us stop them.